Nearly two weeks after coming home I finally found time to write. Just catching up with yard and garden work was time comsuming but now it is raining, no need to be outside. Normally I don't do drawings from my trips, the Midwest is inspiration enough for me at this time. However, I decided to take one of the photos taken from the car while driving through eastern Montana and do some digital work on it. 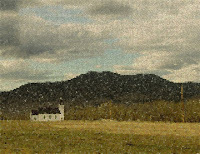 Here it is after combining parts of three different photos, switching the church around and adjusting color and contrast. First thing I did after manipulating the photo was go into Corel PhotoDraw. This is an old imaging software that is over ten years old. Since then Corel bought Painter. I wanted to keep this software for its Paint Alchemy feature. There are other features that it also has that are discontinued on newer software. However, it does not support pressure sensitive tablets. This first version is done with Small Mosaic settings. Not every picture will work well with all of the different settings. It takes some experimenting. I also did versions in watercolor, oil paint, and pastel. For my last version I went into Corel Painter 6, cloned (made a linked copy) and free hand did a version using oil pastels. 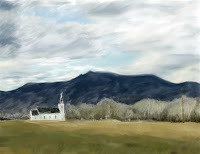 I really don't use Painter 6 much except for doing cloned paintings, so getting a more advanced version isn't necessary. To see larger images, click on the image. Please tell me what versions you like!